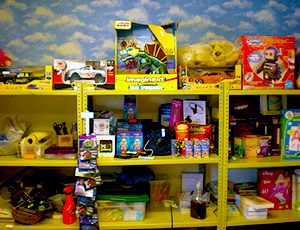 Built by dedicated Casa Pacifica Angels and volunteers, Cloud 9 is Casa Pacifica’s on-campus student store. Children earn points through a number of tasks such as positive participation in cottage, classroom, and on-campus activities. All points earned are used as “dollars” during Cloud 9 outings that both the youth and children look forward to. The store is full of goods from makeup, CDs, and snacks to stuffed animals, toys, books or CD players. Cloud 9 offers an opportunity for the youth to buy items they desire or as gifts for their loved ones. More than just buying power, the Cloud 9 Student Store offers our children the opportunity to understand the responsibilities of money and the reward of healthy behavior! Our Cloud 9 Student Store relies solely on items and products donated by generous volunteers, community members and businesses. New supplies and goods are needed year-round to keep our shelves replenished and to provide coveted items for our children and youth to save for and “buy” with their hard earned “cash”.